Discover the legends and myths and religious beliefs surrounding Satet, the Egyptian the water goddess of the Nile and the annual inundation of the river. She was an early war, hunting, and fertility goddess and revered as the mother of the Nile River. 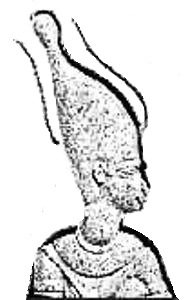 Her conical headdress, the white crown, was called the Hedjet and was the symbol that represented Upper Egypt (the South of Egypt) reflecting her role as the guardian goddess of Upper Egypt. Her crown was bound on either side by antelope horns representing her role as a hunting deity. According to ancient Egyptian mythology she was the consort of Khnum, the Egyptian god of fertility, water and procreation, and the mother of Anuket, the goddess of the cataracts. Together three gods were worshipped as a cult called the Elephantine Triad. Satet was the Egyptian goddess of water and the hunt, a protective deity of Upper Egypt. As a member of the Elephantine Triad Satet was also viewed as a fertility goddess in relation to the yearly inundation of the River Nile and the fertile black soil that came with the flood. Cult Center: Elephantine, an island in the River Nile bordering northern Nubia. 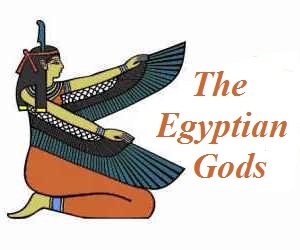 Titles: "She Who Runs Like an Arrow", "She who Pours"
Names of Parents: Khnum, the Egyptian water god of fertility and Anuket, the goddess of the cataracts. Satet, the Egyptian goddess of water and cataracts, featured in the stories, myths and legends in Egyptian Mythology. As a water goddess she was strongly associated with the annual inundation of the River Nile. Her name links her to Setet Island (Sehel Island) and the surrounding area. A major sanctuary on the island was dedicated to Satet on Setet Island and she was worshiped throughout the Aswan area of South Egypt and became a guardian of the annual inundation of Nile. The annual flood, a vital part of the agricultural cycle, was of critical importance to the wealth of Egypt and the civilization of the Egyptians. Too little water would cause famine, and too much flood water would be equally disastrous by limiting the sowing of fresh crops. The River Nile flows from south to north, to its delta on the Mediterranean Sea. The economy of ancient Egypt relied on its agricultural wealth and, therefore, on the Nile. Every year a torrent of water overflowed on to the banks of the River Nile leaving a thick rich mud ( called black silt) that fertilized the land making it ideal for growing the crops that fed Egypt. The inundation (Ancient Egyptian name 'hapi') was of such importance that the Ancient Egyptians based their lives around it. The ancient Egyptians believed that Satet released the inundation when the Dog Star, Sirius appeared in July heralding the annual inundation of the River Nile. As the River Nile flowed towards the north, the annual flood waters entered Egypt by passing Elephantine and by the 18th Dynasty her cult center was established at Elephantine Island. Elephantine is situated at Aswan standing at the border between Egypt and Nubia. Elephantine became the cult center for the three gods Satet the war goddess of the flood or inundation, Khnum and their daughter Anuket, the goddess of the cataracts, who were collectively known as the Elephantine Triad. The Egyptian Nile god, Hapi was also worshipped at Elephantine as he was believed to bring the silt to the banks of the Nile. Elephantine was the capital of the state and for many years was the outer post and military stronghold of the Ancient Egyptian empire. A great fortification was built on the island which served to defend the border of Egypt but also as a place for commerce and trade with the Nubians. This probably accounts for the name 'Elephantine' as there was a brisk trade in ivory at the island. Important Nilometers were located on the Elephantine Island to predict the volume and measure water levels in the inundation of the Nile, indicating catastrophes such as floods or famine. 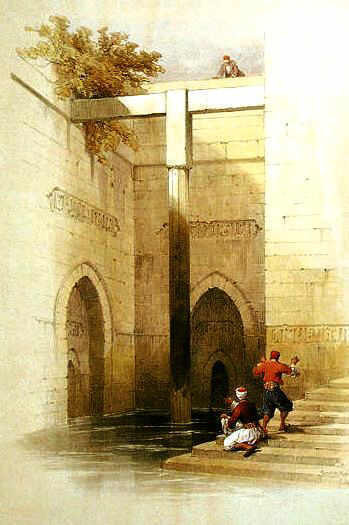 A Nilometer was associated with the Temple of Satet, with a stone staircase that descends down the corridor. The ancient Egyptians left inscriptions on the rocks dedicated to the gods of the Elephantine Triad, Satet, Khnum and Anuket as supplication for safe passage along the hazardous waters to Nubia or as their safe return to Egypt. Satet was first worshipped from as a war goddess, protector and guardian of this strategic southern borders (Nubian frontiers) of Egypt. As a goddess of water Satet was also believed to purify the dead with her water and relates to her title of "She who Pours" and the belief that the source of the Nile was the Underworld. Discover interesting information and research facts about Satet, the Egyptian goddess of water. The facts about Satet provides a list detailing fascinating additional info to increase your knowledge about Satet in Egyptian Mythology. Fact 2: Upper Egypt (south) was called Ta-Satet or the "Land of Satet"
Fact 3: The Nile god Hapi was believed to bring the silt to the banks of the Nile, making farming possible in the middle of the desert. It was believed that Satet and the other two gods of the Elephantine Triad decided how much of Hapi's silt would be delivered during each year's flood. Fact 5: The start of the inundation of the Nile was known as the 'Night of the Teardrop'. The ancient Egyptians believed that the each year, Isis would shed a single tear, which would be caught by Satet in her water jar, then poured into the Nile. Fact 6: The cult of Satet originated in the ancient city of Swenet, now called Aswan, on the southern edge of Egypt. Fact 7: After her consort Khnum became considered a form of Ra, Satet (Satis) became known as the Eye of Ra. 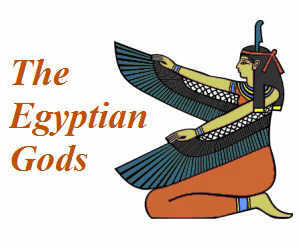 Fact 8: Satet was often depicted holding an ankh due to her association with the life giving flooding of the Nile. A holiday in Egypt offers the opportunity to discover more about Satet and the monuments and artefacts associated with the god. Holidays in Egypt, staying at hotels or taking Nile cruises, enable us to follow in the steps of famous Egyptologists. The Temple of Khnum at Esna, was also dedicated to Satet, and provides a unique insight into ancient Egyptian history. Esna is located approx 45 km south of Luxor (ancient Thebes). There is also a temple at Elephantine Island dedicated to Satet, her consort Khnum and their daughter Anukis.